The Press love using comparisons to tell us how big something is. A common one is how many Olympic sized swimming pools could be filled by the item. Another favourite is comparing the length of something to a number of football pitches. Well, I am going to follow their example this week and tell you that the distance from the car park at Ketts Park to where we were working was the length of 2.5 football pitches (and the same back). That’s because we had to walk across these to get to our start point! And some of us did it two days running! This week we were working in the tree belt along the back of Ketts Park to do some preparatory work for a new path surface. We were working with volunteers from Greening Wymondham on the Thursday. Funding for the new path has been achieved. There is an existing footpath, but this gets very muddy and is barely passable during the winter months. 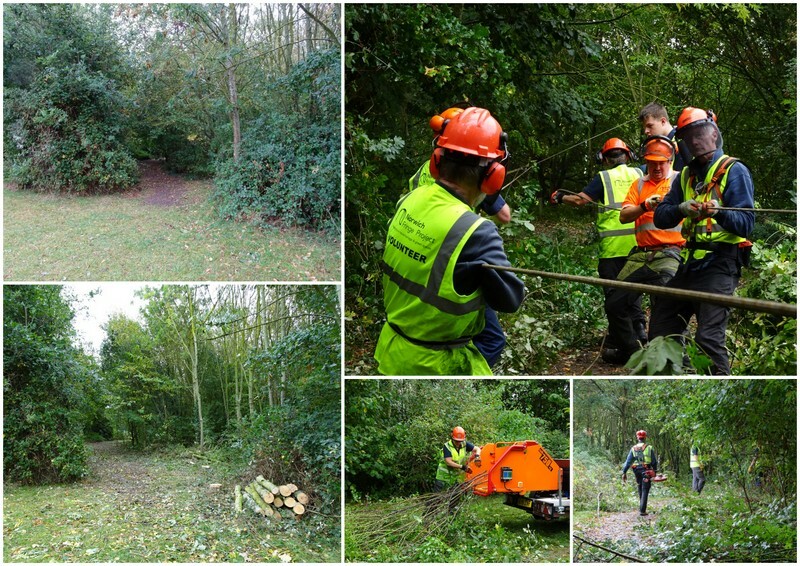 Our task was to cut back the trees and overhanging branches and open-up the route to provide a wider pathway. Matt felled a number of trees (mostly Willow, Field Maple and Hazel) along the edge of the route to open this up and also let more light onto the path. Peter (from Greening Wymondham) and Robert brush cut the brambles and other vegetation to provide clear access to the trees. Other volunteers removed the lower branches of trees along the route (uplift). Removing the lower branches benefits the trees through promoting growth in the upper branches. It also removes hazards for walkers. All the brash from the trees was chipped and blown into the edges of the path. There was a lot of material to deal with but by finish on Thursday we had achieved our target of completing half of the 400-metre path. We returned on the Friday and started from the other end working towards our finish point on Thursday. Today it was very cold and windy on the open recreation ground but fine in the shelter of the tree belt. 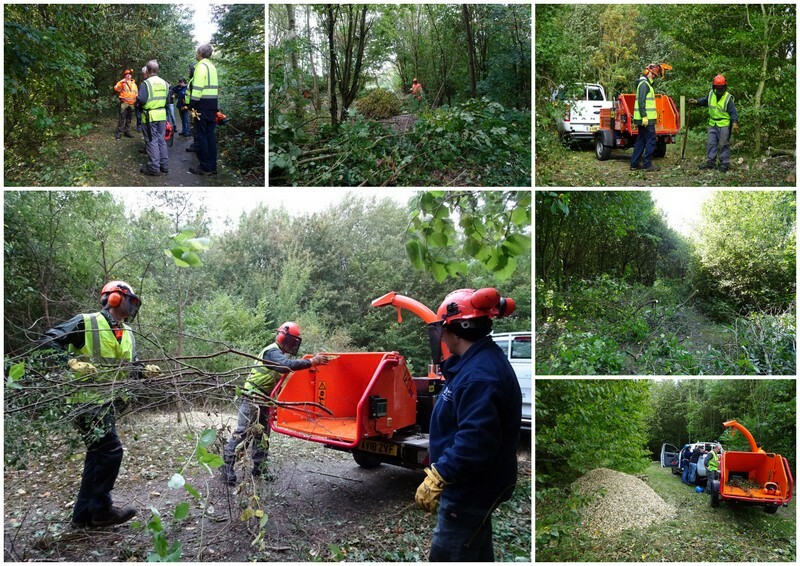 Our work uplifting the trees continued, felling further trees and chipping all the arisings. By early afternoon we had worked our way back to the mid-point of the path and processed all the cut material. We had cleared and dragged a lot of stuff which was very tiring. However, the path was now a lot wider which would allow construction vehicles to do their work and also provide a much lighter walkway for people.